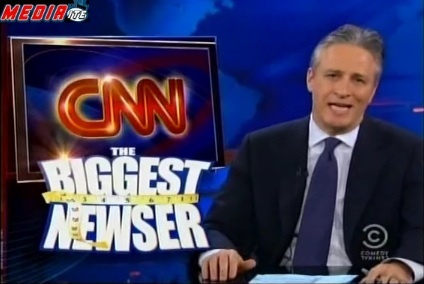 Jon Stewart introduced the following segment by admitting that sometimes he “gets so caught up watching Fox News” that he “forgets to check in on the 24-hour network that started it all.” Of course he was talking about “the most trusted name in news” CNN, who according to The Daily Show appears to have shifted focus from reporting on hard news to playing interactive games and airing viral clips. Though clearly an overstated claim, the following segment contained plenty of evidence of some absurd editorial decisions. It is true that CNN seems to have turned to YouTube and asking user to choose stories for them to report, but its not nearly as egregious as it appears to be in the following segment. Every news outlet has a “soft side” and the sum total of “water cooler” reports makes the editorial direction appear to be much goofier than it truly is. What Stewart neglects to mention in the clip is that CNN’s ratings appear to be on the rise, particularly because of their reportage of real news stories like the Egyptian uprising for example. You may recall that Stewart also made fun of CNN’s Anderson Cooper who was punched by pro-Mubarak supporters in the streets of Cairo. So one could reasonably determine that it doesn’t really matter what CNN does, Jon Stewart will always be their to make fun of them. Watch the following segment courtesy of Comedy Central.